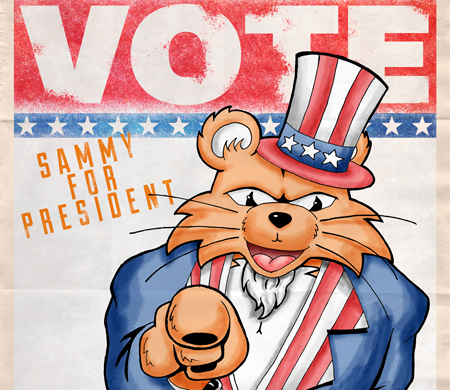 With a nod to this year’s upcoming election, Sam Houston State University will rock the campus and the vote during the 2012 homecoming celebration “Sammy for President,” Oct. 15-20. Homecoming week will kick off on Oct. 15 when university president Dana Gibson, head football coach Willie Fritz and the SHSU athletics teams will lead the campus in a pep rally at noon in Bearkat Plaza. The event will include performances by the Orange Pride Dance Team and the SHSU cheerleaders, who will help pump up the crowd. The homecoming king and queen nominees will also be introduced. This year, the Center for Leadership and Service is implementing a new program to encourage students to volunteer and to embody the university’s motto, “The measure of a Life is its Service,” with a homecoming service project on Oct. 16. Students are encouraged to vote on Oct. 16-17 for the homecoming court nominees and for the health and counseling services referendum, which would raise the medical services fee by $37, as well as a Lowman Student Center referendum, which would raise the LSC fee from $60 to $100. In return, the increase would allow for the construction of a new student health and counseling center and a significant expansion of services, as well as an LSC that would have a larger ballroom and food court and also new entertainment options, including a bowling alley and pub. Students may vote by logging into their school email accounts and voting with the ballot in their inbox. Throughout the week, SHSU departments can join in on the festivities with the annual office decorating contest. Entries will be judged on Oct. 16 based on creativity. An entry form is available online at http://www.shsu.edu/homecoming/contest.html. The registration deadline is Oct. 12. Open Mic Night on Oct. 16, at 8 p.m. in Bearkat Plaza, and the “Sam Jam Carnival” will light up the night on Oct. 17 at 7 p.m. in the Holleman Field parking lot. At the carnival, there will be everything from a Ferris wheel to cotton candy, as well as the announcement of the finalists for homecoming king and queen. Student Activities will also hold the annual homecoming parade, on Oct. 18 beginning at 6:30 p.m. on Sam Houston Avenue. This year’s parade has more than 100 entries from SHSU student organizations, community partners and dignitaries, and an expected crowd of thousands. Those who want to participate in the parade can get a registration form online at the Student Activities website or in the Student Activities Office, in LSC Suite 328. The registration deadline is Oct. 16. On Oct. 19, everyone is invited to a screening of “The Dark Knight Rises,” at 6 p.m. in the Lowman Student Center Theater. Also that evening, SHSU will honor four Distinguished Alumni and one Outstanding Young Alumnus for their contributions to criminal justice, the military, education, and business at the Distinguished Alumni Gala, held in the LSC Ballroom at 6 p.m. The 2012 honorees include Michael Devine, John McManners, Bertie Simmons, Anton Vincent, and the outstanding young alumnus, Siddharth Keswani. On homecoming day, the Office of the President will hold a special rededication ceremony of Austin Hall, following its extensive restoration last spring. The event will begin at 3:30 p.m. on Oct. 20, in conjunction with the annual Alumni Association Coffee. At 4 p.m. SHSU President Dana Gibson and Texas State University System Chancellor Brian McCall will make remarks and the Bearkat Marching Band will play, before leading the way to the football game. Following the Austin Hall rededication ceremony, Bearkat fans are invited to kick off game day with tailgating at Bearkat Alley, where there will be free food and giveaways from various student groups and organizations on campus. Festivities will begin at 4 p.m. at the north end of Bowers Stadium. The tailgate party will be followed by the SHSU football game versus McNeese State at 7 p.m. The first 1,000 fans into the stadium will receive a complimentary 2012 Homecoming "Sammy for President" tumbler. Following the game, there will be a post-game service opportunity, “Scour Bowers,” a way for people to show their appreciation for their university and their stadium by helping clean up. Program Council will help the campus go from orange to “green,” by picking up litter in Bowers Stadium and the surrounding parking lots. Director of Alumni Relations Charlie Vienne said that he anticipates a refreshed wave of Bearkat Spirit for this year’s homecoming and the whole football season. For more information on the Oct. 16 service project, students can contact Meredith Conrey, Center for Leadership and Service coordinator, at 936.294.3467.